From her cineplex seat, Sarjit takes us to the wide screen and fills us on the story line, casts and producer. A locally produced movie set in Malaysia in the 1970's and 80's , Ola Bola takes you back in time to reminisce the rich Malaysian culture and football history. The powerful and universal message it conveyed was - Always stand united in diversity. Read on. We were awestruck by the heartwarming story and remained fixed in our seats. The jazzy tune lingered on, before the curtain virtually came down. We had a diverse mix of audience. Young and old. Everyone clapped and clapped. And clapped. What would the meaning of life be, without varying situations? Is the pathway to the world we dream of. This movie couldn’t be screened at a more appropriate time when our hope account is in a dire state. I was overwhelmed with emotions and nostalgia. The subconscious and universal message conveyed was overpowering. We must not lose hope. Individual dreams become a collective one for the nation. This motion picture charts the trials, tribulations and triumphs of the Harimau Malaya football team back in the 70’s. Though certain plots were fictional, it takes you back in time into the Malaysian history, from a cultural and football perspective. It drew on the glorified days of our yellow and black team who qualified for the 1980 Olympic Games in Moscow, Russia. Malaysia, however, boycotted her participation together with 65 countries to protest Soviet’s invasion of Afghanistan and its subsequent refusal to withdraw its troops. “Goaal, goal, goal, goal, goal, Goooaal !” cried Rahman in triumph, the passionate sports commentator. This is one person who breathe, eat and sleep football. I just adored his zest for life. A wise man once said, when you follow your passion, you will never work a day in your life! Ola Bola is a truly epic production by our local talent, Chiu Keng Guan who also took Malaysian cinemagoers on ‘The Journey’ two years ago. The subject of football is close to Chiu’s heart as he served as a striker for his school’s football team and also in University when he studied film at the Beijing Film Academy. Certain scenes reduced me to tears. Muthu confessing that the only one thing he was good in life – was football. How sheltered our world was! It also portrayed how Chow Kok Keong’s sister decided not to pursue her studies to support him, only to have him pull out from the sport over certain emotional team conflict, which truly frustrated her as this unprecedented act defied her struggles. The boys were constantly juggling between earning a decent living and making time for the love of their lives. These were true sacrifices. They worked hard at football purely due to their passion. Monetary reward was unheard of. The film showcased the best of Malaysia – its diverse culture, language and tropical landscape. An authentic – Made in Malaysia product, for Malaysians! I felt so proud to be a Malaysian, sitting in the cinema that day with fellow Malaysians. Scenes were rewinded back to the 70’s and 80’s. I was transported in a time capsule back to my childhood days. The ohh-so-familiar smell of coconut harvest and rubber trees. They were our lifeline and economic backdrop. Chiu took us through the jovial, fun fair days with Ferris wheel, merry-go-round and game stalls in a carnival style. There was also free and easy joget on stage with charming ladies in kebaya. Black and white TV was shared by kampung folks. I recalled our home converting into a theatre and sometimes stadium those days, as Dad was the first few acquirers of the magic box! We led very simple lives with simple entertainment. But we were very happy inside. It was refreshing to hear unknown yet talented casts conversing multi-lingually from English to Bahasa Malaysia to Mandarin, Hokkien, Cantonese and Tamil. It was just like good old P. Ramlee movies. After all, this is how we speak in Malaysia – rojak or mixed across languages. Few words sometimes. So few. Because our eyes did all the talking. And yet, we completely understood each other. Cinematography was spectacular, covering historical landmarks such as Stadium Merdeka, Victoria Institution, the tranquil train ride between Beaufort and Tenom. Also the lush green, tropical rainforest of Broga Hill in Selangor. My, they looked like paradise! I felt as if I was flown into another amazing country. The irony is – this is our beloved country! Why do we have to ‘travel’ so far only to realise that we have the best jewels here – up where we belong? The movie featured evergreen characters in their prime football era namely Tauke Soh Chin Aun, Arumugam aka Spider Man, Mokhtar Dahari or Super Mokh, Santokh Singh, Shukor Salleh, Khalid Ali and James Wong. They were the pride and glory of our country, competing against the giant football teams of Korea and Japan. These icons are proof that dreams do come true! They played football for the love of the game. “We go forward as a team. We win together. We lose together,” was their team mantra. A simple yet winning recipe. I believe, the world’s greatest football legends are within us. The Pele’s, Maradona’s, Ronaldo’s and Messi’s of the world are all right here! We don’t have to look far. We need to leverage and learn from our Malaysian football legends’ skills, experience, passion and energy. The tribute paid to Soh Chin Aun at the end was THE moment. Thumbs up to Chiu, for recognising our true champions. The unsung heroes! The story was based on a simple premise – United we stand, Divided we fall. A powerful message, under current trying times in our country. Each cast had their personal struggle. Personalities conflicted and threatened to tear the team apart. We laughed and wept as we followed each unique character. Their united love for football helped them overcome their differences to achieve a common goal. And they simply left behind, whatever that divided them. My wise football friend had this to say: “The Football Association of Malaysia has a starting point for a blueprint. Play this inspiring Malaysian story to your new and budding talents, among others. I am not saying this one movie will change Malaysian football forever. But the time has come to reflect and make a change to our football landscape. We need to build in our future generation, a world class team. We have what it takes. Care must be taken to ensure monetary compensation is secondary, not their main motivation”. The message is clear and compelling. 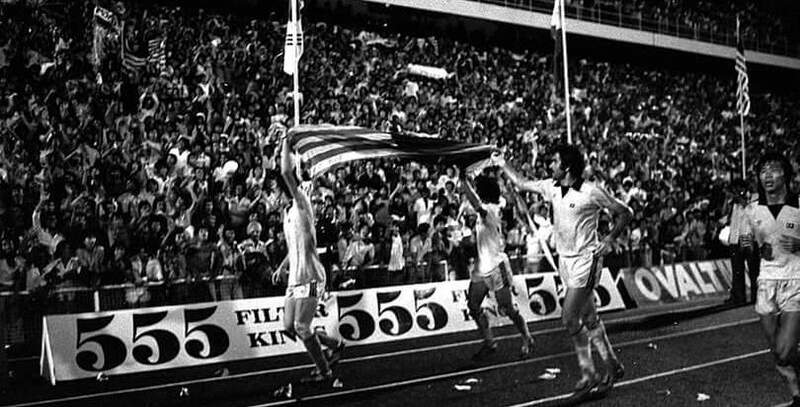 Malaysia must relive her glorious yester years. Be it in sports, in the spirit of oneness in the people, in just about everything! We have the talent and inspiration from our past and living legends and mentors in every field we can think of! Let’s relive our glorious yet soulful Malaysian Dream. We have always been united in diversity. We will continue to unite in diversity. And go the distance. Faith, hope and love will take us there. In God, we trust. From our hearts, we say – Malaysia truly Boleh!